Sharing platters are probably our favourite style of food to serve at weddings, parties and events. We love relaxed, family-style dining where guests can help themselves. Not only do sharing platters taste great, they also make an impressive centrepiece that’s worthy of an Instagram snap or two. If you’re currently planning your wedding menu, here are some of our top tips for creating and styling the perfect sharing platter. When it comes to sharing platters, you want to make sure they taste good as well as look good. That’s why you should always start by choosing a theme for your sharing platters. What kind of cuisine will it include? Is it for starters, mains or dessert? Does it need to be veggie or will you include meat? Is it for summer or winter? Once you’ve had a think about all this, it will be easier to see what your theme will be. Perhaps you’ll go for a Mediterranean-inspired tapas board, or a traditional British cheese and chutney plate, or a seasonal seafood platter. Keeping your theme in mind, it’s time to choose the tasty food you want to include on your sharing platter. Usually with sharing platters, the majority of the food doesn’t require cooking, or can be prepared in advance - which is really helpful if you’re busy trying to organise the rest of your wedding or party! 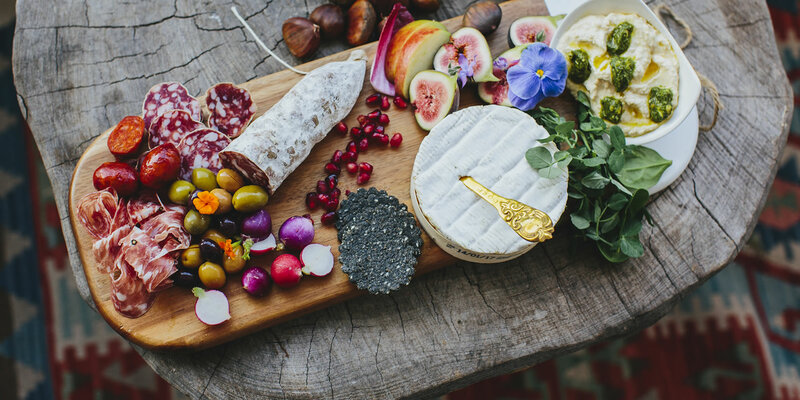 Things that work really well on sharing platters include salads, artisan bread, cured meats, cheeses, sauces and pickles, fruit, crudités, smoked fish and crackers. If your sharing platter is for a main course, rather than starters or snacking, you might want to focus on fewer elements and serve them hot. For example, we love creating slow cooked lamb shoulders, served on a sharing platter with rosemary roast potatoes, honey roasted parsnips and seasonal greens. Now it’s time for the fun part - putting it all together! Start by deciding what you’re going to serve your sharing platter on. Wooden or marble boards, slates or large flat dishes work best as the base for your sharing platter. Then have a think about any elements (such as sauces, chutneys or olives) that might need a ramekin, small bowl or jar to serve them in. For a really delicious sharing platter, you’ll want things to look quite decadent - so pile on lots of mouthwatering food! Think about how things will work together, and what should be placed next to each other. We like to look of relaxed sharing platters where everything is scattered (on purpose, of course! ), but you could also opt for neater boards where everything is laid out in lines. Try placing small clusters of one item in between handfuls of another - think parma ham loosely folded next to slices of artisan bread, with a small bowl of olives below and wedges of several types of cheese scattered across the board in between rocket leaves. We think the key to the perfect sharing platter is leaving very little space uncovered. Start with the larger items or anything in bowls/jars, then fit in the small items around that. If you have some gaps that need filled, pop on some extra crackers, a small bunch of grapes, some sliced figs or a few pieces of salami.